Grape vines are “woody”, as opposed to “herbaceous”; their growth is limited by pruning. 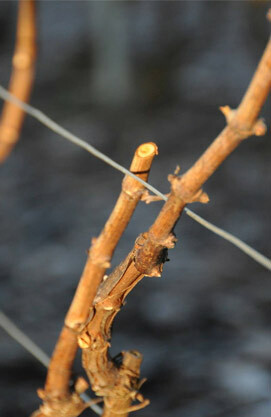 Pruning allows the vine to produce new shoots, controls the volume of production and improves the quality of the grapes. Of the five types of pruning authorized in Champagne, we use only those allowed for Premier and Grand Crus: “Chablis” and “Cordon de Royat”. Pruning is done in winter. We begin in November and finish in March, with a break during the coldest periods. In April, after pruning, new shoots are tied to the metal wires that support the vines (le liage). This gives the vines their characteristic shape. In May, unproductive shoots are pinched off by hand to leave the vine more energy to produce more fruit. This is called l’ébourgeonnage. In May and June the vines grow quickly; the wires supporting them are raised progressively (le relevage). In June and July, branches are carefully arranged to favour maturity and avoid rot. They are held in place by biodegradable plastic “staples” – this is called le palissage.